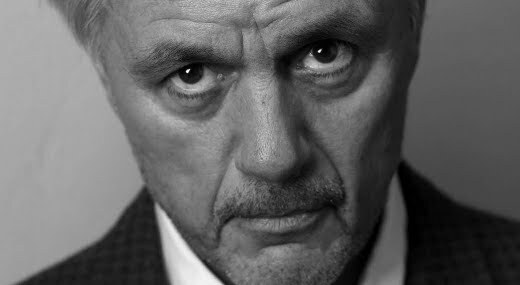 In September of 2008, believing it to be "inappropriate" reading material for students, a staff member at New Hampshire's Plymouth High School lodged a complaint with the school's library in an effort to have John Irving's novel, The Hotel New Hampshire, removed from their shelves. Thankfully an internal investigation quickly followed, and an overwhelming vote saw the book reinstated. On a positive note, a decision by the school's librarian, Pam Harland, to subsequently inform the author's agent of the situation resulted in the following response from Irving himself. 86 Old Ward Bridge Rd. 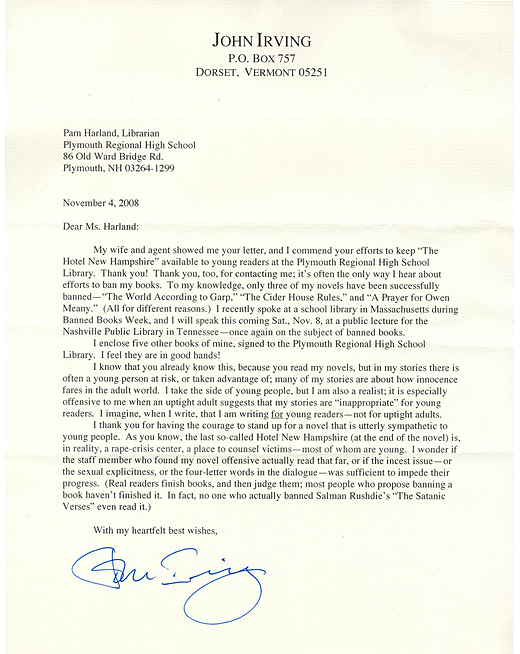 My wife and agent showed me your letter, and I commend your efforts to keep "The Hotel New Hampshire" available to young readers at the Plymouth Regional High School Library. Thank you! Thank you, too, for contacting me; it's often the only way I hear about efforts to ban my books. To my knowledge, only three of my novels have been successfully banned—"The World According to Garp," "The Cider House Rules," and "A Prayer for Owen Meany." (All for different reasons.) I recently spoke at a school library in Massachusetts during Banned Books Week, and I will speak this coming Sat., Nov. 8, at a public lecture for the Nashville Public Library in Tennessee—once again on the subject of banned books. I enclose five other books of mine, signed to the Plymouth Regional High School Library. I feel they are in good hands! I know that you already know this, because you read my novels, but in my stories there is often a young person at risk, or taken advantage of; many of my stories are about how innocence fares in the adult world. I take the side of young people, but I am also a realist; it is especially offensive to me when an uptight adult suggests that my stories are "inappropriate" for young readers. I imagine, when I write, that I am writing for young readers—not for uptight adults.